Poor Commissioner* Smith, he still doesn’t get it. 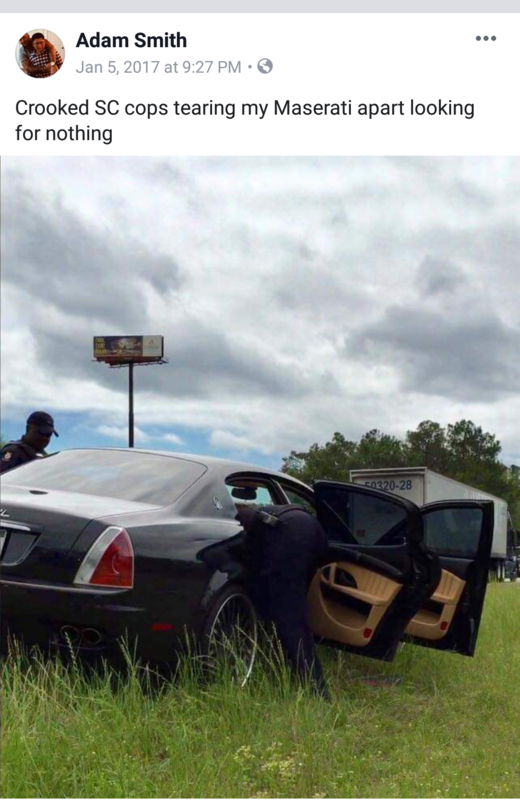 The man appears to have ZERO respect for the law. Readers may remember that back on January 28th, 2019, I made a legal public records request to receive copies of ALL emails to or from any elected official in Ramseur. You might also recall that one of my first record requests was for documents accounting for Commissioner* Smith’s spending, which I first wrote about here. From the beginning it’s been an uphill battle to get any compliance out of most of the commissioners, but Smith has gone out of his way to evade the law, and doesn’t appear to have any intention of fulfilling his obligation as a public official. Last Friday, March 29th, I received a copy of the email you see below, forwarded to me by Town Clerk Bobbie Hatley, and a bit later another copy came from Mayor Shaw. I did not, however, receive a copy from Commissioner* Smith, as required by law. I’m glad our Town Clerk keeps me in the loop, but she shouldn’t be babysitting grown men who volunteered for the job of town commissioner and all that comes with it. That’s not what we’re supposed to be paying her for. 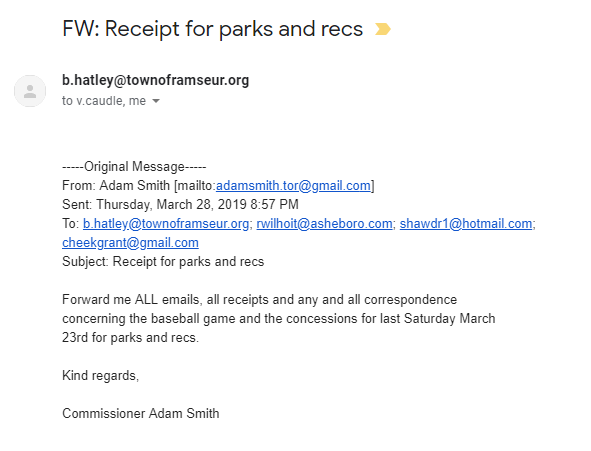 Look over the email above; notice that Smith is still using a private email address, adamsmith.tor@gmail.com, as opposed to the account the taxpayers of this municipality supply him, and all other officials of the Town of Ramseur, for official use. Why didn’t he send his request for Parks and Recreation information to Commissioner Caudle, who is the board member assigned to manage that department? Instead, Smith sent his demand – for all emails, receipts, and other correspondence pertaining to the little league tournament that took place on March 23rd at Leonard Park – to the clerk, his next door neighbor, Commissioner Cheek, attorney Bob Wilhoit, and the mayor. Notice also that he sent a copy of his request to the mayor’s private email address. Makes me wonder just how many emails I’m not seeing. I guess Smith didn’t listen to the recording of the March 4th board meeting, from which he was absent without leave. If he had he would have heard Commissioner Caudle’s impassioned plea for board members to use their official email accounts for town business, in hopes of building more trust between themselves and the public. In over two months I have yet to see anything sent from any account Grant Cheek uses. The only thing I see are emails sent by Suez or other vendors to Commissioner Cheek, forwarded by Clerk Hatley. What was Smith’s aim in requesting all that correspondence, and why didn’t he go straight to the source and request the information from Commissioner Caudle? Did he hope to pique my interest and prompt an investigation into her spending? If so, that ship won’t be leaving the dock anytime soon. On the day I made my first request for all emails from our elected officials, Commissioner Caudle responded to me immediately and has sent me copies of every email conversation involving town business that I am entitled to see ever since. In addition, she has answered any question I’ve asked without hesitation, so I have no reason to suspect any inappropriate activity on her part. I can also say the same thing for Commissioner Overman. Every time I’ve asked him a question he has answered. I don’t always agree with the positions either commissioner takes, but I respect their honesty. I can’t say as much for the other members of this board, since Mayor Shaw and Commissioners Cheek and Cox spent the better part of 2018 being dishonest with me, and with other citizens in my presence. As for Commissioner* Smith, he made this personal when he defamed me shortly after this blog came into being, making unsubstantiated allegations to attorney Wilhoit, about an imagined conspiracy between myself and Web designer David Turner. Mayor Shaw often wonders why most citizens don’t seek his counsel or value his opinion. Personally, I have neither the time nor the inclination to be lied to anymore. 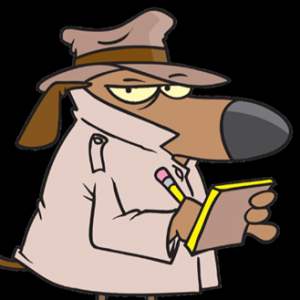 If the mayor wants to talk, he knows where I live and he has my telephone number, but I’m done spending time in his office. The same goes for any member of the Board of Commissioners; you want to talk to me, pick up the phone or drop me a note, but I’d advise against unannounced home visits. In response to Commissioner* Smith’s demand for information last Friday, that same afternoon I received copies of at least thirty emails sent from Commissioner Caudle to Smith, covering every conversation and transaction that went into reestablishing little league baseball in Ramseur and putting together the opening day tournament last weekend. The image below shows my email inbox and most of the forwarded messages that were sent to Smith, copied to me in compliance with my legal, ongoing records request. 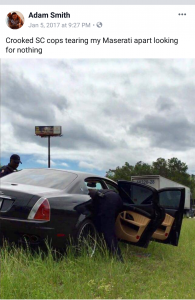 Hopefully he’s spent the weekend pouring over them, and finding nothing. As you can see, this work took many hours of Commissioner Caudle’s time, not to mention involvement with officials from City of Asheboro, local nonprofits, churches, and many others including vendors, coaches, and community volunteers. I seem to recall a previous board voting to compensate another commissioner for time spent “volunteering” above and beyond the call of duty in the administrative office a few years ago, before hiring him full time. Given the amount of time and effort Mrs. Caudle has put into her department over the last year or so – far beyond that of her peers – perhaps the Board should consider offering her a little compensation for her time as well. I certainly don’t see anyone else on our Board of Commissioners burning as much midnight oil with any regularity.